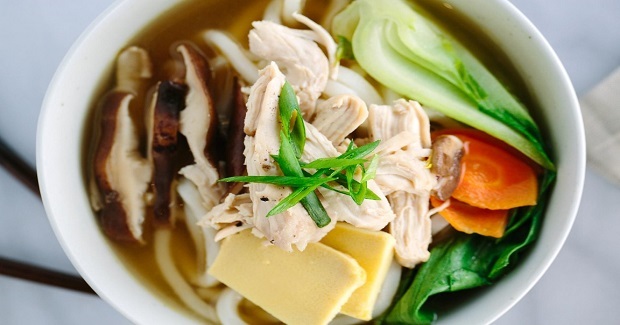 Chicken Udon Soup with Bok Choy - Gutom Na! Posted on Saturday, January 16th, 2016 at 8:53 am. Remove stems from mushrooms; reserve stems. Thinly slice mushroom caps; set aside. Combine mushroom stems, chicken broth, ginger slices, crushed garlic, green and green onion in a large saucepan. Bring to a boil. Cover, reduce heat and simmer 20 minutes. Remove from heat. Let stand 10 minutes. Strain stock through a sieve over a bowl; discard solids. Heat a large saucepan over medium-high heat. Add canola oil to pan; swirl to coat. Add reserved sliced mushroom caps and carrots to the pan, and sauté for 2 minutes. Add minced ginger and minced garlic; sauté for 1 minute. Add sake, and cook for 4 minutes, scraping pan to loosen browned bits. Add strained stock to pan. Bring to a boil, and reduce heat to medium-low. Add soy sauce and pepper, taste a season as needed. Add shredded chicken and bok choy, simmer for 2 minutes or until chicken is thoroughly heated. Cook udon noodles according to package directions, omitting salt and seasoning (if included), drain. Divide noodles evenly among 4 bowls. Add 1 cup soup and vegetables to each bowl. Sprinkle each serving with 1 tablespoon green onions and serve with egg if desired.